The Garvin Trust consists of a 1.25-acre parcel at the corner of Richland Avenue and Laurel Drive. This parcel was generously donated to ALC by Mrs. Lonnie Garvin in memory of her husband, Judge Lonnie A. Garvin. 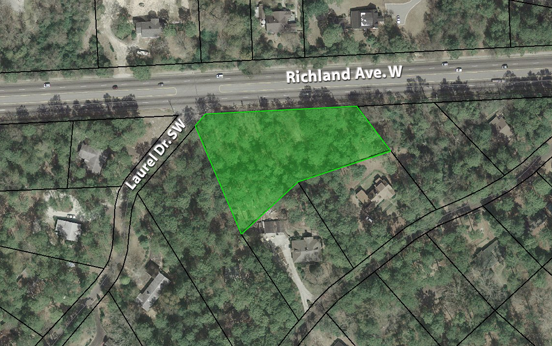 This steep, wooded lot will remain permanently undeveloped, insuring that drainage to Rollingwood Lane will not be increased. Long leaf pines on this tract tower over a thicket of kalmias sweeping down the hill—an oasis of natural beauty at the entrance to Aiken. The Garvin Trust preserves some of Kalmia Hill’s history. Judge and Mrs. Garvin were the first “settlers” of Kalmia Hill when Mrs. Mattie C. Hall developed it. The Garvin and Hall houses were the only ones on that side of Richland Avenue for several years. When the Judge saw a realtor showing the lot that has become the Garvin Trust, he bought it as soon as he had finished lunch to make certain that it would remain open, a green and lovely buffer between the traffic on Richland Avenue and a quiet neighborhood. Aerial photo showing the 1.25-acre Garvin Trust, which was donated to ALC.